I don’t like rushing into things. Three weeks ago, the resident artiste provided me with five morning lessons of gentle sitting and stretching, gentle Yoga moves for Salute to the Sun. That was three months after she gifted me a “high-end” Yoga mat for Mother’s Day. Like I said, I don’t like rushing into things. On the first day, the Tabby cat took position on her living room perch in preparation to supervise. As we have seen in a previous post in another blog, she’s not a fan of exercise for the sake of exercise. On the sixth day, I proceeded to perform the sweaty, grunty feat in the privacy of my room. Soon the Old Boy wandered in to complain and rearrange my sweaty towel. The Salute to the Sun routine goes something like this. With time and commitment, I shall be so graceful and poised. It has been two weeks during which I think I have succeeded in getting myself into a routine as part of a healthier lifestyle. As with most challenges in life, you just gotta remember to breathe – and repeat as necessary. I am grateful for the resident artiste, bread baker, cook and cat sitter for persistently nudging and motivating me. It’s only a matter of time before she turns me into a vegetarian too. What small steps do you take to keep yourself in good overall health? You might be interested in this book I wrote about a priest, his biological daughter and a retired exotic dancer dealing with family issues in a small Georgian Bay town during the 1970s. Nice analogy. 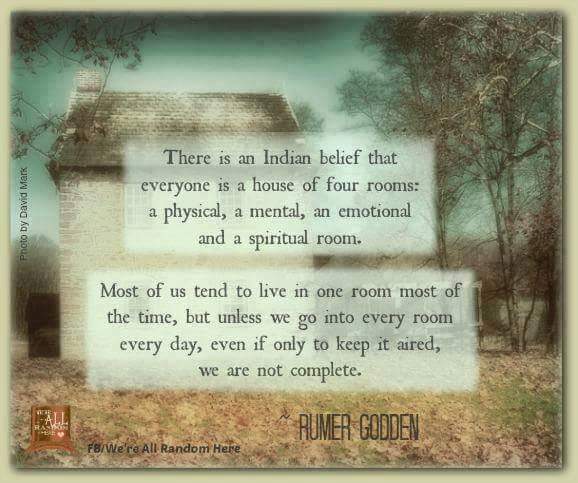 I aim to visit the four rooms every day.